Serious shooters and marksmen will stockpile much specialized equipment as they go through the process of learning to shoot. Rifles, optics, and ammunition are of course a given, but many will end up with a wide array of other tools in the quest to become better shooters; bags, bipods, ballistic calculators, shooting rests and other specialized tools have all earned their place in the toolbox of the marksman. Above all the others, however, I believe there is one fundamental tool that nearly all great shooters have and don't hesitate to make use of: a training firearm chambered in .22 long rifle. Introduced in the late 19th century, the .22 long rifle is the most produced ammunition cartridge in the world today and I believe there are very few gun-owning households without at least one .22 kept somewhere. It's no secret that shooting is an expensive activity. After the cost of equipment and range fees, you still have to pay for ammo. Ammo for centerfire rifles and pistols is not inexpensive, with many long range and competitive shooters paying more than $1/ round for premium ammunition. Dry-firing and positional practice are important, but they only go so far. Decent-quality bulk .22 ammo can often be found for well under 10 cents a round, while even high-quality target cartridges in .22 can be found between 20 and 25 cents a round. I always appreciate a chance to get my semi-custom CZ 452 trainer to the range. Fundamental technique makes up the core of successful shooting practice, whether you're shooting an air rifle at 10 meters or a custom precision rifle at 1200. Because the recoil, noise, and flash from a .22 are nearly non-existent, they can strip down the variables and reduce the whole performance to an execution of fundamentals. If you're shaky on your breathing, trigger pull, or follow through, getting on paper with a .22 will show your weaknesses every time. As shooters spend time shooting - especially centerfire cartridges with significant noise and recoil - it is very common for them to develop a flinch. This happens when the shooter begins to anticipate the shot and associate the pull of the trigger with the recoil and noise. Flinching may manifest as jerking the trigger or pulling the muzzle of the gun downwards. Because a .22 removes these negative side effects, a couple sessions focused on good trigger control with a .22 is a great "cure" for somebody who has developed a flinch. No matter what type of gun you shoot or sport you participate in, there is probably a .22 caliber trainer available - and likely at a reasonable cost! From single action revolvers and lever action rifles to military rifles, today it's easy to find a .22 for nearly any use. Conversion kits to fire .22lr cartridges are available for many common firearms, such as the AR-15, 1911, and CZ pistols (to name but a few of the more popular conversions). These kits allow you to take advantage of rimfire training, using your gun exactly as it's set up. In the precision rifle market, where shooters can spend thousands of dollars on equipment and training every season, manufacturers have responded with high-quality rimfire trainers which emulate the handling of their larger-bore cousins. Vudoo Gun Works offers a full sized rimfire repeating action which accepts standard Remington 700 stocks and triggers as well as bottom metal designed to accept AICS magazines. Masterpiece Arms recently stepped up to offer their chassis system for the CZ 452, one of the most popular precision rimfire rifles on the market, along with full precision builds on the same action. As avid gun owners, we act as ambassadors for the sport and lifestyle of shooting. Often, we will have the unique opportunity to introduce a new shooter who may have never had an experience with guns. Because of the low noise and recoil, anybody who's ever fired an air gun can easily fire a .22 (with proper supervision and safety training, of course) and new shooters often find that they are very addicting. Firing a gun for the first time can be an overwhelming experience and, if handled poorly, can turn a new shooter off altogether or make them afraid to continue learning. A .22 makes for a very rewarding experience and can get a new shooter comfortable with the fundamentals and safe handling of firearms. Most experienced shooters agree; shooting competitions and matches, even at a friendly club level, are a great way to test and extend your skills. Getting out of your habitual target shooting routines and experiencing new styles of shooting is a great way to expand your repertoire and sharpen your technique under the supervision of qualified range safety officers. .22 matches are especially popular at the local club level because they require a minimum equipment investment and can be done on relatively small ranges. While there are too many types of shooting match to list them all, here are a few of my favorites (follow the links to find out more about each). NRA Smallbore - "Strings" of 10 shots fired at black bullseye targets from a fixed distance. Shooters fire from a combination of standing, sitting, kneeling and prone positions and are scored based on the proximity of their shots to the center "X" ring. Nearly any .22 rifle is suitable to compete, and fairly generous time limits allow shooters to be successful with manual repeating actions and limited magazine size. I have seen shooters do these matches successfully with single-shot falling block actions. Other than a well-sighted in rifle and a shooting match, the only other "necessary" piece of equipment is a spotting scope or pair of binoculars to spot your shots if not using a scope. Rimfire Challenge - Based on the National Shooting Sports Foundation's very popular Steel Challenge matches, rimfire challenge has shooters engage a series of steel targets under a timer and compiles the string time to score the shooter. Rimfire challenge specifically allows shooters to engage with a handgun or rifle from "low ready" position and doesn't require a holster or other specialized equipment. Shots are taken from a stationary, standing position at the shooters' own speed which makes it a very easy style for getting started. National Rifle League .22 - A Precision Rifle League meant to standardize club matches around the US and allow shooters to compete with a minimal investment on the part of the club. Each NRL 22 match involves 5 stages with a mixture of prone, positional, and barricade-based stages out to 100 yards. National Rifle League is relatively new to the scene, but the NRL 22 is proving to be very popular because it allows shooters to get into tactical-style precision shooting with a relatively approachable equipment cost. As I said before, there are far too many competitions to list here, but there's a very good chance that you can find a .22 match near your location to sharpen your skills. I find that gunmatchadvisor.com is an easy-to-use website for locating matches. I have no affiliation with them but recommend the site as a convenient tool. Most of us hardly need an excuse to make another gun purchase, but I think a .22 trainer is a solid choice for anybody looking to make an investment in their shooting skills. Do you have a favorite rimfire trainer? 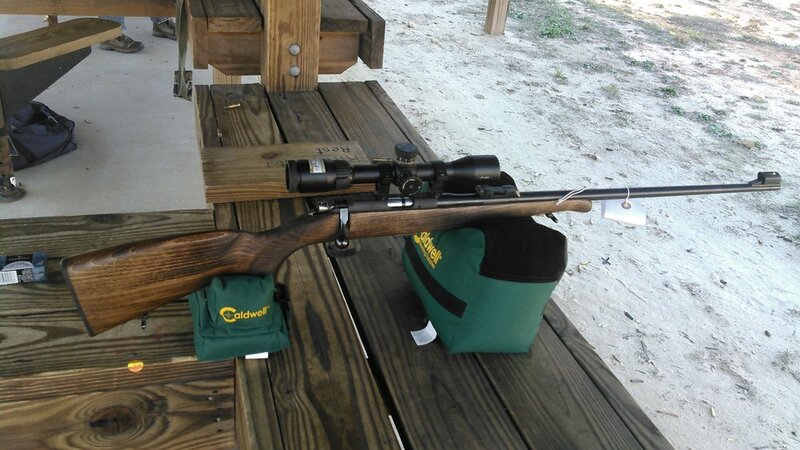 Love participating in a rimfire shooting sport? Share your experiences in the comments, or feel free to send me an e-mail (dakota.potts@gmail.com) if you have an experience or gun you'd like to see shared on the site!